Newcastle, Maitland or the Hunter Valley, call Dee Glass! Welcome to Dee Glass Newcastle & Metford. We Specialise in all Glass Repair & Replacement, Shower Screens, Security Doors, Windows, Sliding Glass Doors, Glass Splashbacks & Commercial Glazing. 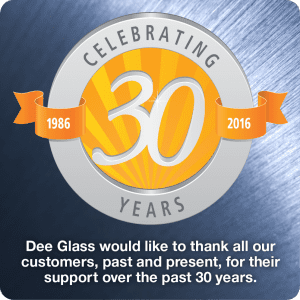 Here at Dee Glass Newcastle & Metford (near Maitland), we are a family owned and operated business that has been specializing in glass and glazing services for over 25 years. With our head office located in Metford’s CBD and a mobile glazing & glass repair service operating from our Mayfield West workshop, we are able to serve the entire Newcastle, Metford, Maitland, Lake Macquarie and Hunter Valley region. In addition to repairing and replacing glass windows, we also offer a shower screens supply & installation service, security doors and safety screens, glass splashbacks, commercial glass & shop fronts, mirrors & mirrored wardrobe doors, window repairs & installation, aluminium window installation and almost any other related glass products. We are committed to bringing you the very best service and value possible, so contact Dee Glass Newcastle or Metford (Maitland) for a free quote today. Our UNBREAKABLE 6 point guarantee will give you peace of mind.